Pinch Valves directly from the Manufacturer to see at SCHÜTTGUT & RECYCLING-TECHNIK 2017 in Dortmund / Germany. The new nominal diameter DN125 of the VMC series is currently available with a stainless steel body and in the connection types of R/T/F/FA. From March 2016 our new nominal diameters of the VF series are available in our usual high quality. You will find the flanges in 3 different material variations. NEW! 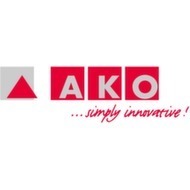 Leading Pinch Valve Manufacturer AKO presents FAQ page. Frequently asked questions answered by AKO. Get answers to various questions around the topic of shut-off valves - FAQ area implemented on AKOs web site. The AKO Manual Pinch Valve of VZ series is designed with a flange connection complying with DIN EN 1092 PN10/16 and ANSI B 16.5- 150 lbs as standard and is available in nominal diameter DN80. Free flow of product, minimum frictional resistance, 100% leak free, no blockages and low net weight are among the most important benefits of air operated Pinch Valves. Pinch valves have proven to be a universal problem solver to shut-off abrasive, solids-containing media. Threaded hose nozzles are the flexible solution for hose connections of various kinds such as suction/discharge hoses on plant, machinery or vehicles. AKO Air operated Pinch Valves of VMC Serie: The flexible modular system for detachable and aseptic piping connections! Reliable and cost-effective!, The compact valve solution for the shut off. For example dust, granule, powder, suspension, sewage, air venting etc. Overview of AKO Air operated Pinch Valves - the valve solution for abrasive, corrosive and fibrous products like granules, powders and slurries. Air operated Pinch Valves type VT, aluminium design with semi-silo trailer connection acc. to DIN28459. Downloadable CAD models available for AKO Air operated and Mechanical Pinch Valves available. AKO Pinch Valves with clamp fittings and weld-ends with inch sizes now available!